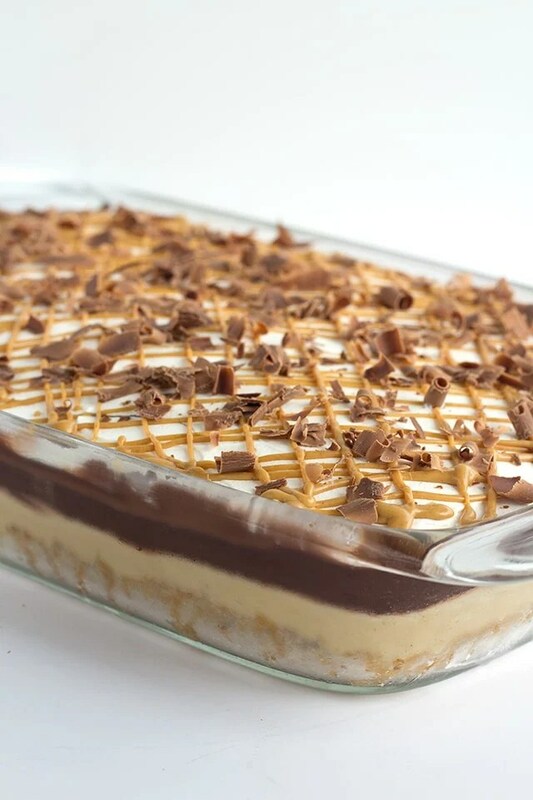 This chocolate peanut butter layer dessert is packed full of flavor! There’s a sweet and salty pretzel crust, a peanut butter cheesecake layer, chocolate pudding, hot fudge, and whipped cream. Add a drizzle of peanut butter on top with some chocolate curls! 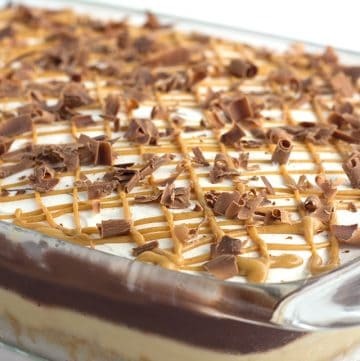 Peanut butter desserts don’t get tastier than this one! So I feel like people love layered desserts and I want to make what people like. 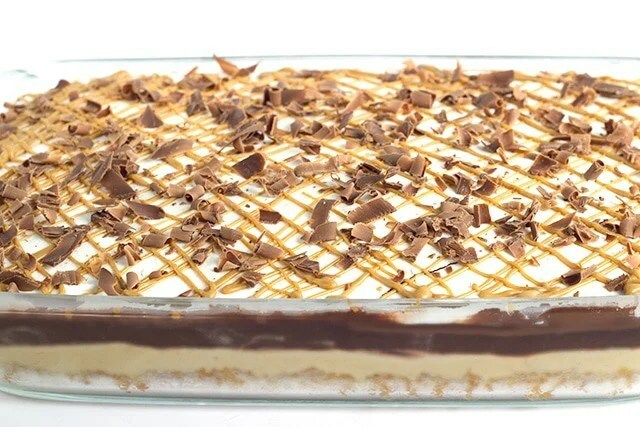 That’s why for this month’s peanut butter desserts bash, I made a chocolate peanut butter layer dessert with loads of layers. The theme this month is peanut butter and pretzels. Of course, I can’t help but add chocolate into most peanut butter desserts. It’s a habit that I have that I’m not anxious to change. They belong together. This layered dessert recipe doesn’t take long to throw together. I’ll admit it does dirty a couple of dishes, but really it’s not bad at all. I would say two bowls if you reuse the bowls for the next steps. I’m known to do that because I hate washing dishes. Even with a dishwasher. Hate it. So I wanted to tell you about all of these layers in this dessert. First layer up is the pretzel crust with butter and sugar. Second layer is a peanut butter cheesecake mousse. Third is a chocolate pudding. Fourth is a jar of hot fudge drizzled all over that pudding. Fifth layer is whipped topping. Then you can add some garnishes.. or not. I’m cool with either. I was inspired to make the pretzel crust because of pretzel salad. I LOVE pretzel salad. It’s sweet, salty, creamy, jiggly and basically perfection. Have you noticed that either people really love the pretzel salad or really hate it? It makes me giggle. I personally could eat it every day but my dad about tosses his groceries just looking at it. 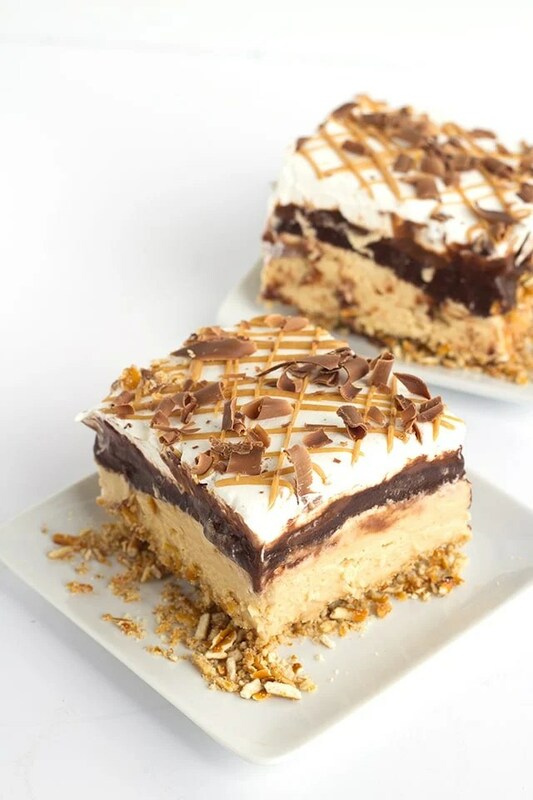 Love peanut butter desserts? 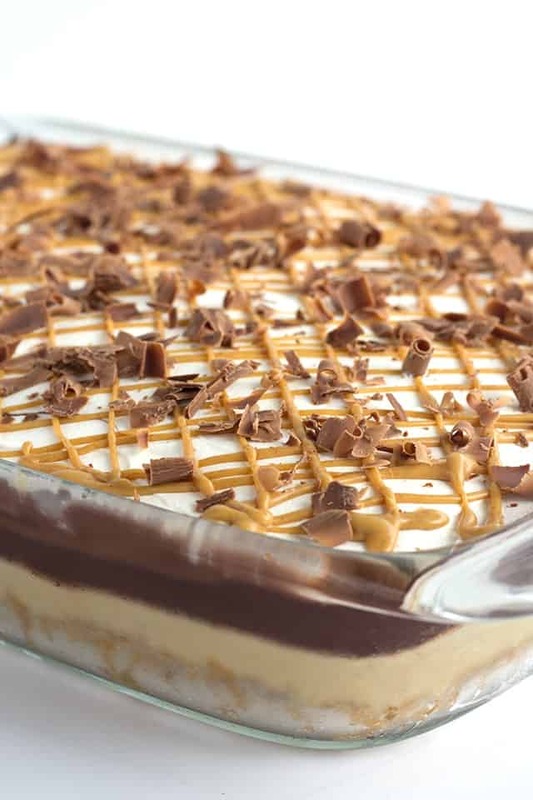 This rich chocolate peanut butter layer dessert recipe will do the trick. The sweet and salty pretzel crust is amazing! In a 9x13 pan, add in the crushed pretzels, granulated sugars, and melted butter. Stir to coat all the pretzels in the melted butter. Firmly press the crushed pretzels into the pan. Place into the oven and bake for 10 minutes. Remove from the oven and let cool. Begin working on the cheesecake filling. In a medium bowl, add in the cream cheese, peanut butter and butter. Beat on medium/high until light and fluffy. Add in the sugar and vanilla and beat until incorporated. Add in a quarter of the whipped cream and fold it into the cream cheese mixture. This will lighten up the mixture before adding the remaining whipped cream and deflating it all. Add in the remaining whipped cream and carefully fold it in. Spread the filling into the cooled crust. Be sure to get to all of the edges of the crust. Seal off any holes on the edges to prevent the pudding from seeping through and making our pretzel crust soggy. In a mixing bowl, add in the chocolate pudding mix and 2 cups of milk. Using a handmixer, beat on medium until incorporated. Let thicken about 5 minutes before spreading on top of the cheesecake layer. Spread the pudding evenly over top of the peanut butter cream cheese layer. Be sure to get to the edges. Remove the lid from the hot fudge topping and microwave for 45 seconds. Scoop all of the fudge topping into a sandwich bag. Cut a small hole out of the corner of the sandwich bag. Drizzle the hot fudge topping all over the top of the pudding. I started from the corner and drizzled back and forth until everything was covered. Spread the whipped topping all over the top of the dessert. Again, make sure to take the topping all the way over to the edges. Add the 1 1/2 tablespoons of peanut butter into a sandwich bag. Place into the microwave for about 20 seconds. Squish it around in your hand to make sure it's all runny. Cut a small hole in the corner of the sandwich bag. Drizzle peanut butter on top of the dessert. I drizzled one direction all the way across the dessert and then drizzled in the opposite direction all the way across. 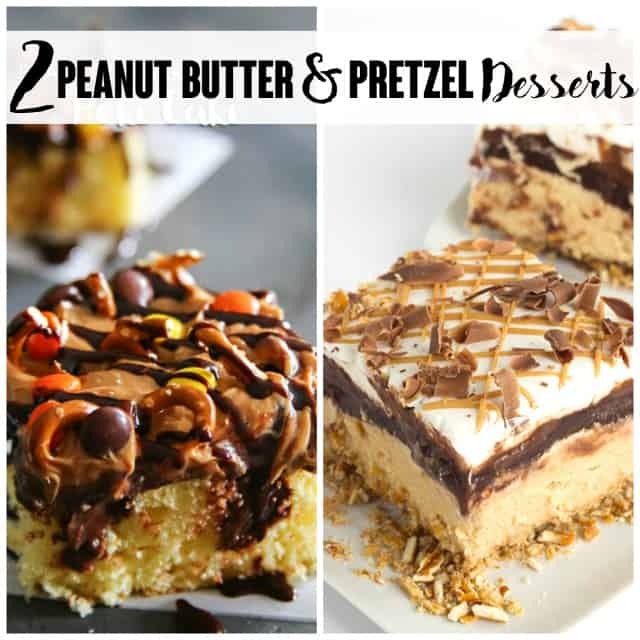 Join us in the peanut butter desserts fun over at The Peanut Butter Recipe Box Facebook Group! We would love to see you there! Check out the recipes we made while you’re at it! Peanut Butter Pretzel Poke Cake from Kleinworth & Co. In instructions, #2 crust says 9×3 pan, where I’m sure you mean 9×13. I noticed when I went to print it. Oh my goodness! If I only had chocolate pudding and hot fudge, I would be making this right now…lol. Thanks for sharing your recipe on Merry Monday. Pinned. Does this hold up in fridge if making ahead of time for a large group? I’m assuming this uses an instant pudding mix? How does this hold up in the fridge? Does it get wattery? It does get watery after a couple of days. Could you use cool whip in place on whipping cream? T butter what that’s mean..
Hope u give me the answer..because I’m already have crust..
What kind of chocolate is shaved over top? I used a sharp vegetable peeler and ran it down the side of a room temperature Hershey’s chocolate bar to make the chocolate shavings. This looks amazing! I love the sweet/salty combo. Can’t wait to try making a gluten free version. Yum! Can you use like a sweet and low baking suger . I don’t see why you couldn’t in this recipe!